Compared to the iPhone’s tiny onscreen keyboard, the version on the iPad is nearly touch-typable, especially in landscape mode. But if you plan to use your iPad for serious data input—such as writing an article like this one—you’ll want a real, physical keyboard. Apple’s official option is the iPad Keyboard Dock, which combines an iPad-optimized version of the company’s no-keypad keyboard with a sturdy dock base. But one of our favorite iPad surprises is that you can instead use any Bluetooth keyboard, including Apple’s own super-portable Wireless Keyboard. Whichever you choose, the advantages of an external keyboard go beyond the tactile differences between an onscreen keyboard and a physical one. Apple's real keyboards also give you more keys, special-function keys, and the capability to use a number of standard Mac keyboard shortcuts. 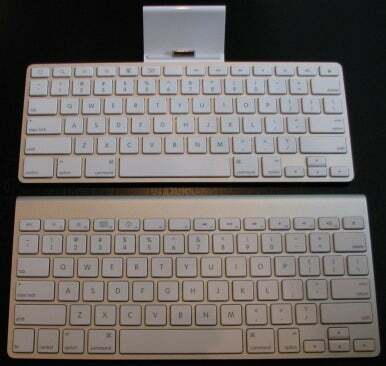 But which should you choose, the iPad Keyboard Dock or a Bluetooth keyboard? It depends on how you plan to use an external keyboard. I've been using both options over the past week or so; here are some things to consider when making your decision. The iPad Keyboard Dock and Apple’s Wireless Keyboard each costs $69 (unless you’re a Mac user who already owns the Wireless Keyboard, in which case this decision is easy). But keep in mind that to use the latter, you’ll need some kind of dock or stand. You can use Apple’s iPad Dock, but that will set you back another $29. For many users, an external keyboard will serve mainly as a “docking station” that you bring your iPad home to. But an iPad and an external keyboard together weigh less than most laptops, so for some people, the combination may be a desirable alternative to a laptop for lots of typing on the road. So which is more portable? While there are some tiny Bluetooth keyboards out there, Apple’s Wireless Keyboard is the smallest I’ve seen that still provides full-size keys and a Mac layout, making it an ideal partner for the iPad. The Wireless Keyboard weighs only 11.4 ounces and is just three quarters of an inch thick in the rear; most of the keyboard is only an eighth of an inch thick, letting it slip easily into even a crowded bag—if your iPad will fit, chances are the Wireless Keyboard will fit, too. Of course, you’ll need some sort of stand or dock, but my cheap book stand weighs only 3.8 ounces and folds flat; Apple’s iPad Dock—which is 1.25 inches tall at the top of its cradle—weighs 5.2 ounces. So the total weight of Apple’s Bluetooth keyboard and a dock or stand will be somewhere between 15 and 17 ounces. One of the Keyboard Dock’s biggest advantages over a Bluetooth keyboard and a separate dock is stability. Thanks to its heavy, deep base and non-slip bottom, the Keyboard Dock is unexpectedly secure. The iPad doesn’t shake at all while you’re typing, and even when you tap the very top of the screen, you get only a tiny bit of wobble. This is a welcome feature considering that, even with the keyboard’s special-function keys (see below), you’ll be tapping the screen often. In a pinch, you even can place the Keyboard Dock on your lap; as long as you keep your knees together, you can type with decent stability. I was surprised to discover that each of Apple’s two Docks holds the iPad at a noticeably different angle: The iPad Dock tilts the top of the iPad back approximately 10 to 15 degrees; the Keyboard Dock tilts the iPad back about 30 to 35 degrees. The greater angle of the Keyboard Dock is necessary because it places the iPad so close to you—the iPad must lean back a good amount to give you a good view of the screen. When using the iPad Dock, you can simply push the dock farther away for a better view. The Keyboard Dock’s other big advantage is that it provides, in place of traditional function keys (F-keys), a number of special-function keys. Specifically, the top row of the Keyboard Dock’s keyboard includes dedicated Home, Spotlight, Picture Frame, Onscreen Keyboard, and Screen Lock keys, as well as keys for screen brightness (Down and Up), media playback (Back, Play/Pause, Forward), and volume level (Mute, Down, and Up). The playback controls control playback even when the iPod app is in the background.